When ideas become mainstream people assume they are right and stop testing them. People start parroting words without thinking. Perhaps I’m just contrary for the sake of it. I like people who try to think before they write, who dissent and perhaps above everything else, write well. I like the way they think, even if I don’t agree with what they think. Evgeny Morozov’s long examination of the career of Tim O’Reilly “The Meme Hustler” is pointed and personal but I agree with him on one thing. Even when your cloak your beliefs in supposedly neutral technical language they are still beliefs, they are still an ideology (whether you agree with that ideology or whether you don’t). Don’t use language to pretend that beliefs are facts. Mat Honan makes some good points about “Twitter’s big challenge: too much twitter” in Wired magazine. I’m a Twitter junkie myself. But is it actually in Twitter’s interest to curate more for its users? Isn’t the point about twitter that it’s about the power of personal recommendation and personal relationships with people you trust? If Twitter interferes in this, through promoted tweets (spam), advertising or some other kind of impersonal automated recommendation doesn’t that undermine what people like about it? We should not trust people just because they are experts, but if we are not prepared to put the time and effort in to understand something, to take a step beyond that column we read in The Guardian or “what my friend Phil told me”, then we are placed in a position where must defer and try and make the best decision we can as to who we should defer to. When did coffee become a symbol for civilisation? 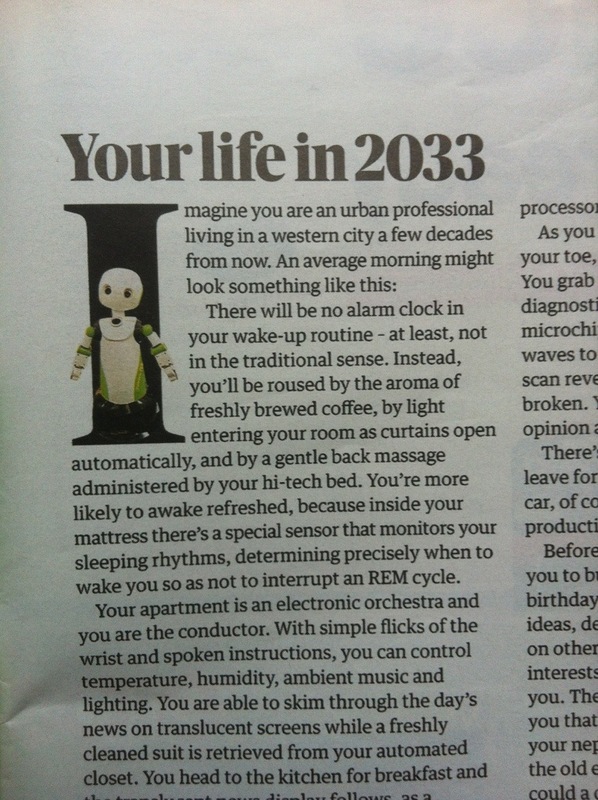 An extract from Erik Schmitt’s new book about the future (“Your Life in 2033”) in last Saturday’s Guardian started with a nice coffee. It’s not online yet so here’s the first couple of paragraphs at the end of this post. It looks like the future for some people is going to be exactly the same as the past and the present: all needs catered. This time by software and machines rather than slaves or servants. There’s always “freshly brewed coffee” to start the day. I mean everybody likes coffee, don’t they? This entry was posted on	April 12, 2013 at 8:08 am	and is filed under Chaos, Uncategorized.